View from inside Green Monster at Jet Blue. 1. Last year Donald Trump tweeted that A Rod is “an average player now that he is unable to use drugs.” 2 days ago, Trump compared singer Debby Gibson to Derek Jeter and then said, “We love Derek. That’s not an A Rod statement. It’s a Derek statement.” Another slap. 2. Yankee set up man David Robertson was diagnosed with a sprained foot after slipping on a step while emptying a box in the recycling can outside his home. His Opening Day is in jeopardy. The NY Daily News reports that the Yankees are alarmed. Love it. 3. Lawrence McCutchen, Buc centerfielder, wore #25 before veteran A.J. Burnett arrived in the Steel City. McCutchen told A.J. he could have his old numerals if he agreed to pay a fee of $500,000. Turns out the financially shrewd Pirate was just starting high so that Burnett could feel good about working him down. The 2 players settled on a $20,000 payment. In what major field is McCutchen’s college degree from Oklahoma, you ask ? Why, a B.S. in Economics, of course. 4. Felix Doubront has just completed a sterling outing against the Yankees in Tampa as I write this. The lefty went 4 innings, yielding 2 hits and 0 runs. He faced only 14 batters to secure 12 outs. This guy is going to contribute. 5. The Red Sox will be a lot harder to hate in 2012 according to the Wall Street Journal. The primary reason for this is that “goofy, slow, arrogant”, and yes, “excellent”, Jonathan Papelbon is now a Phillie, and has been replaced by “a pair of genial, vanilla New Yorkers.” i.e., Andrew Bailey and Mark Melancon. Perhaps the WSJ is forgetting that Yaz and Rico were both mild mannered New Yorkers that thrived in Boston in an era when the 5 Boroughs lacked no bellicosity for the Sox. 6. The two jamokes broadcasting tonight’s Yankee – Red Sox game from Tampa on YES just said that Pete Rose had 33 triples for the minor league Tampa Tarpons in 1962 or 1963. Pretty close. Charlie Hustle had 30 triples for the Class D Tarpons, batting .330 and leading his team to the best record in the Florida State League in 1961. The Manager of that team ? Double no-no man, Johnny Vandermeer. 7. Clay Buchholz spoke with self-confidence to Ron Chimelis of the Springfield Republican after pitching 4 scoreless innings on Sunday. He said he knew early in spring training that he would “…be ready to throw with maximum effort in game situations.” The lower back stress fracture is a thing of the past. 8. Tom Caron explained on NESN.com that Pedroia, Ellsbury, and Gonzales are all each capable of winning the 2012 AL MVP. Moreover, Caron said, “I do expect Adrian Gonzales to have an even bigger year this year.” Seriously, Tom ? Better than 2011, when he posted .338, 27, 113, and a league-best 213 hits ? I’ll have whatever Tom is drinking. 9. The Globe’s Pete Abraham predicts that these 5 Sox will be on the D.L. on opening day: Carl Crawford, Rich Hill, Bobby Jenks, John Lackey and Dice K Matsuzaka. Crawford won’t be out for long. And MLB.com’s Ian Brown reports that Dice K threw free and easy on Saturday. The Interminable One may be back earning his pay before Hill, Jenks and definitely before John Shell Lackey. 10. 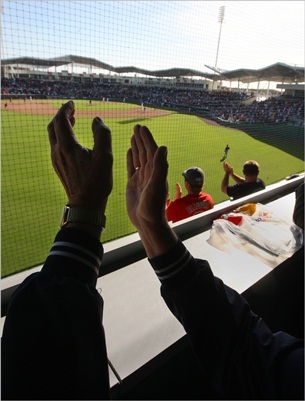 WEEI’s Gerry Callahan took credit this morning for the installation of 258 seats inside the Green Monster at Jet Blue Park in Fort Meyers. The self-absorbed Callahan explained how the idea to create those seats was derived by Larry Lucchino from a conversation Callahan had years earlier with the BoSox President. I guess you have to have a healthy ego to be the unerring airborne voice of authority in Boston. Crazy Callahan. This entry was posted on March 14, 2012 at 2:13 am	and is filed under BASEBALL, Boston Red Sox, NEW YORK YANKEES, RED SOX, yankees. You can follow any responses to this entry through the RSS 2.0 feed. You can leave a response, or trackback from your own site.